In this Paysbook review, I'm going to help you decide for yourself if Paysbook is legit or a scam. 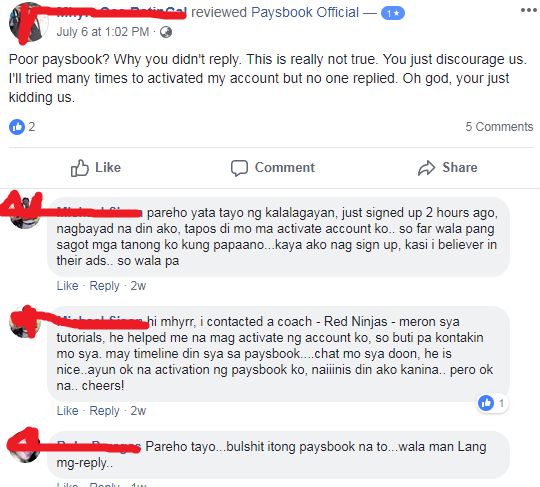 I learned about Paysbook when someone posted about it in a local buy and sell Facebook page in my city. The post was your typical "business opportunity" post wherein the person who posted about it talked of how he's making money in his "spare time" doing nothing but log in online. What a pile of crap. I know right there and then that this is yet another cash-grab put together by a group of people who prey on the gullible. It still blows my mind how people still fall for these types of online business opportunities. How can there be a business when they don't even have a clear product or service? A product or service that you can't get from anywhere else with less hassle. I'm telling you right now. Stay away from this company. Never in a million years will you be able to earn sustainable income from them. Remember Supreme Wealth Alliance (SWA)? Or Ignition Marketing? Where are they now? They promised the moon to their members. But where are they now? I bet my house that Paysbook is going to suffer the same fate. "Need more help? Contact our support that is always help you with any questions, problems, and information"
- Walang period at the end of a sentence. - "Contact our support that is always help you..." If you are going to get people to entrust you with their hard-earned cash, at least make your grammar right. - Wag kayo maniwala na maayos support nila. Just read the reviews on their Facebook page. Andaming reklamo about their customer support. 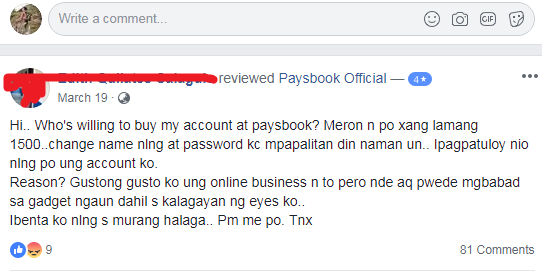 Ngayon, kung malaki ang kitaan sa Paysbook, bakit marami ang nagbebenta ng kanilang mga account? Let's address the elephant in the room here. How exactly do you earn money from Paysbook? Well, according to the company, you earn from sign-in rewards, login rewards, posting rewards, direct commissions, matching commissions, and leveling commissions. Okay, these seem to be at least reasonable. But doesn't it bother you what they keep on talking about rewards and commissions but they can't seem to directly and clearly put out what exactly it is that they are selling. What are their products? What are their services? The answer lies in the fact that you need to buy an activation code for a whooping 1000 pesos. Isang libo, pare. Activation code lang yan. Hahaha. As to their leveling commissions, familiar ka na siguro diyan. Downlines and uplines chuchu. Lol. And furthermore, you earn by inviting people to join the company. Pag isa sa mga core business models ng isang company is to pay people to invite more people into the company, lumang tugtugin na yan. Andaming mga tao at pamilya nasira ng mga modus na yan. "Be cool and join today. 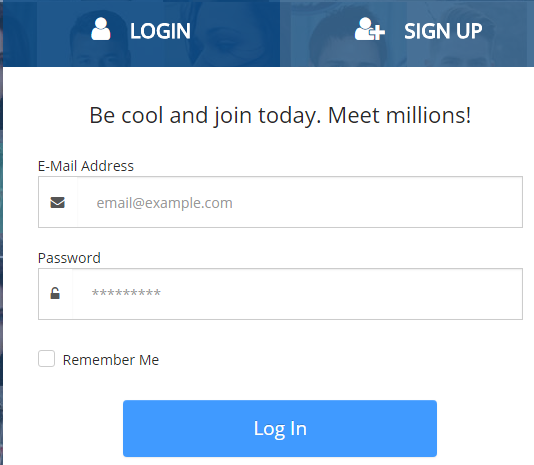 Meet millions!" Anong millions? What millions? Are you claiming to have millions of members? Eh sabi ng founder at CEO niyo sa Official Informercial Video niyo na around 11,000 plus lang members niyo. Millions daw. In a nutshell, stay away from this company. Instead of wasting your 1000 pesos to buy an activation code from them, invest it somewhere else or deposit mo na lang sa banko mo. Doon kikita ng interest. Maliit pero sigurado. What happened to business ethics? What happened to protecting the privacy and security of your members and customers? You are an online company so you should deal with these issues internally. Why are you posting the names of your customers in a public digital page? Paysbook is being managed by a bunch of amateurs. Amateurs who can't even get an editor to correct the wrong grammar in their website and marketing materials. Amateurs who don't know anything about business ethics and consumer privacy. 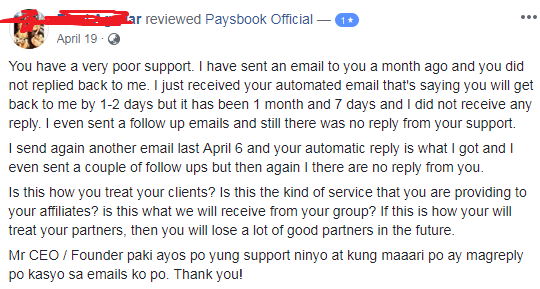 To all consumers, stay away from Paysbook. Masasayang lang pera at oras niyo diyan. To the founders of Paysbook, ayusin niyo business model niyo. Create products and services that are actually valuable to people. Paysbook keep saying that the company is a combination of social media platform, e-commerce, and affiliate marketing program. To the consumer, puwede mo lahat gawin ito without Paysbook. Create a blog, publish valuable content in it, and monetize it with affiliate products from companies like Amazon and Lazada. Signing up with Amazon, Lazada, and other affiliate programs are free. Hindi ka pababayarin ng 1000 para lang bigyan ka nila ng activation code. Promote affiliate products in your own website. Kikita ka if you work had and work smart. Supplement your income from your blog by signing up with advertising programs like Adsense. Free ulit mga yan. Hindi ka magbabayad ng 1000 pesos for an activation code. Gawa ka ng account sa mga legit na social media sites like Facebook and Twitter and promote your blog in these platforms. That's how you do it. It takes time to earn a decent income from the process but you will get there if you work hard. 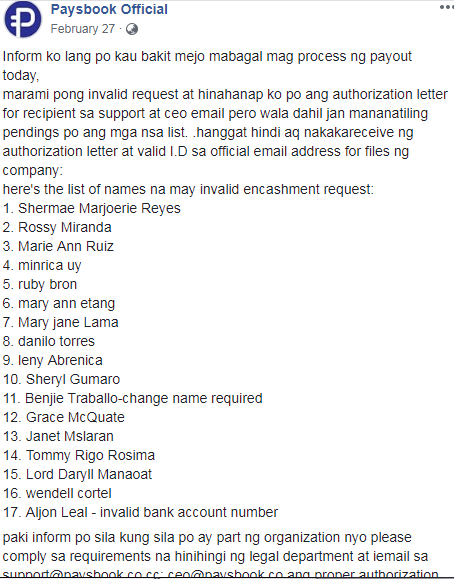 Hindi yung magbabayad ka ng activation code, tapos log-in log-out ka, tapos invite ka ng maraming tao, tapos kikita ng libo-libo. Kalokohan. If you really want to learn about making money online, Google is your best friend. Everything you need to learn about e-commerce, online advertising, and affiliate marketing are free online. You just have to spend the time to learn and apply what you learn.